Maximum size: 0.9 mm shell diameter. Identification: Shells of this species have a low spire with strongly inflated whorls. 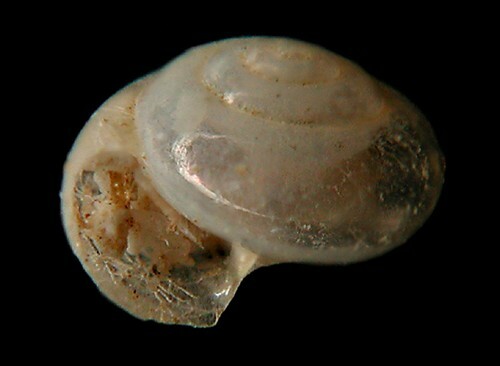 Natural history: Shells of Limacina lesueuri are moderately rare in sand samples. Distribution: Maui, French Frigate Shoals and Midway: circumglobal. Photo: CP: 0.9 mm in diameter: from a sand sample provided by Mike Severns and PF; off Makena, Maui; Dec. 4, 1991.